Most loved Maharashtrian savory snack, now non-fried, but equally yummy! Do try this scrumptious gluten free and vegan waffle, that is crispy on the outside and fluffy inside. Whats more? My version of Kothimbir Vadi is ready in a just few minutes as opposed to the traditional recipe! Get this recipe for all the taste without the hassle. Close up time! Can you smell the irrestible aroma? 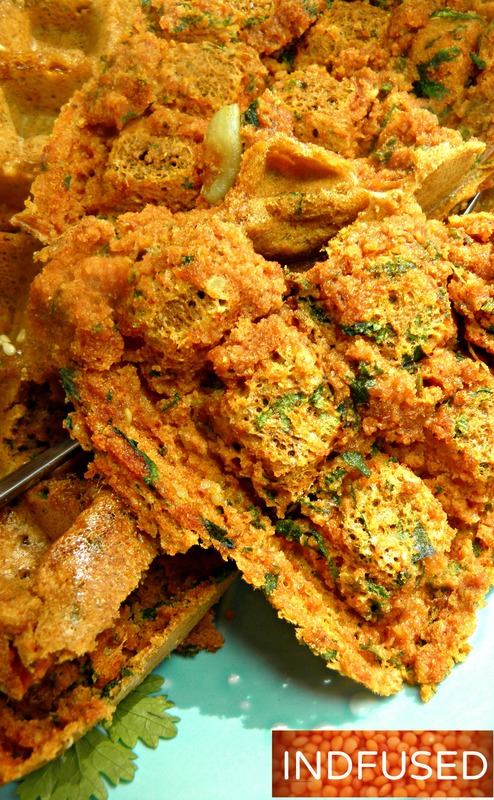 If you love pakodas, you will love kothimbir vadi. It is a favorite tea time or anytime snack in Maharashtra, India. Kothimbir is the Marathi word for the coriander or cilantro plant. In the traditional recipe, the leaves are combined with besan or chick pea flour along with aromatic spices, steamed, cooled, cut and then fried. In my quest to get the same taste without frying, I made kothimbir vadi in my Belgian waffle iron. To the batter which is normally made of besan flour, I added idli rawa, which is cream of parboiled rice. That gave the waffles a crispy texture like fried kothimbir vadi. For the aromatics, ginger-garlic paste, sesame seeds, smoky cumin and coriander seed powders all make it an unforgettable snack! Plus I skipped a few steps like steam, cool , cut and then fry. All the taste without the hassle and the extra time makes this a winner in my book! Lightly spray the waffle iron with cooking spray. I used olive oil spray from my Misto spray bottle. Preheat the waffle iron. 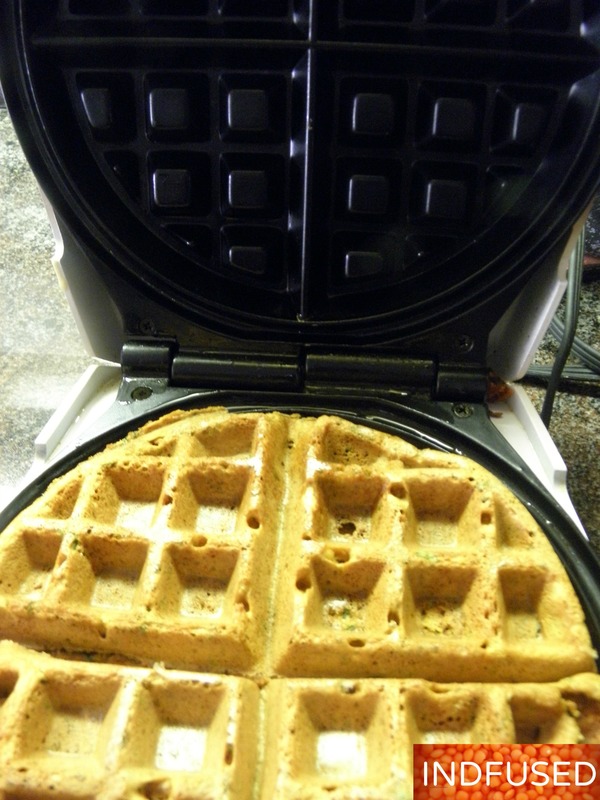 Pour 2/3 cup batter (quantity will depend on your waffle iron) in the waffle iron. Close the lid and let it cook until the waffle is golden brown on the outside, and cooked and fluffy inside, about 4 minutes. That is it folks! Your kothimbir vadi waffle is ready in 4 minutes cooking time. Repeat with the rest of the batter. In a bowl, mix the dry ingredients –besan, idli rawa, coriander and cumin seed powders, sesame seeds, turmeric and chili powders, brown sugar and salt. 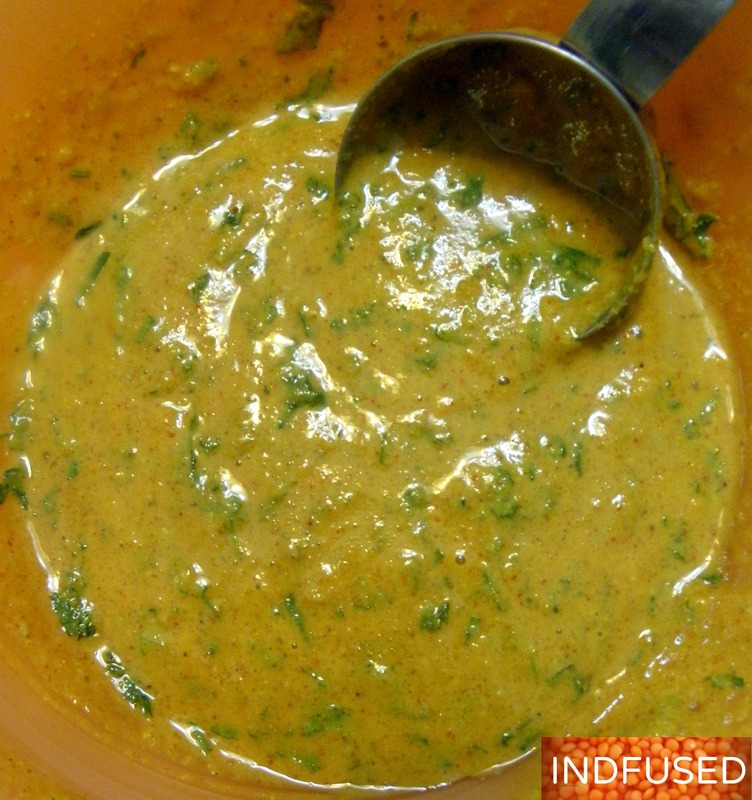 Combine well and add the chopped coriander leaves, grated ginger and garlic and the oil. Stir in the water gradually to make a batter the consistency of pancake or uttapam. Preheat the waffle iron. Spray with oil and put in 2/3 cup batter for a Belgian waffle iron. Let it cook for about 4 minutes, or until golden brown and crisp on the outside and cooked and fluffy on the inside. Serve with green chutney, if desired. Cooked to perfection between top and bottom layers of the waffle- great combination of crispy crunchy and soft middle! Enjoy this truly moreish snack anytime! This is a batter that needs no fermentation or waiting period, so a scrumptious vegan, no gluten snack or light meal is ready within minutes! This looks amazing!! And so much easier than the traditional ones, wonderful though they may be. I am sure calorie wise your way is very healthy! Your new and innovative techniques and takes on traditional recipes is just wonderful. It makes it so much easier for us to approach these traditional treats. Thank you so much Pamela! I am happy that this recipe cuts on time and calories.Do try it. Thanks again for your sweet words. I truly appreciate them. Thank you so much! Do try it. We liked it a lot. OMG. How did you think of this to turn into a pancake,you are so creative..will try for sure!! And it is quick and easy. Thank you Aruna! Do try it. I loved the fact that the taste and texture was so good without the deep frying. I love chillis and waffles so they make the perfect combination I love the look of these. Thank you so much Ana! Do try these savory waffles. I love the way you cook! awesome! Thank you so much dear Liz! This recipe is very different from the waffles that I usually make, and I really ant to try it. It sounds delicious. Thank you Sheryl. 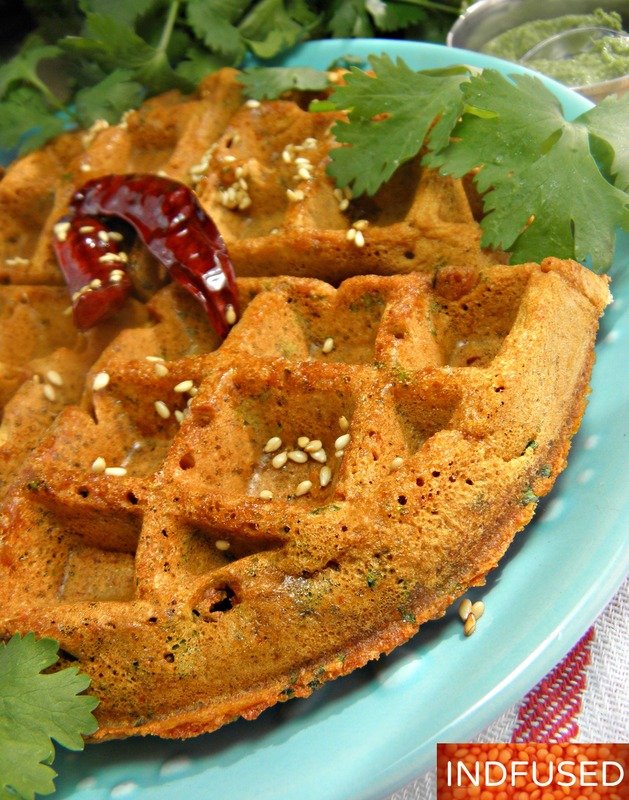 It is a savory waffle plus the chick pea flour gives it a nutty taste. I absolutely love it. Do let me know how you liked it. Hi there, so glad the blogging boost facebook group connected us. I’m your newest follower. 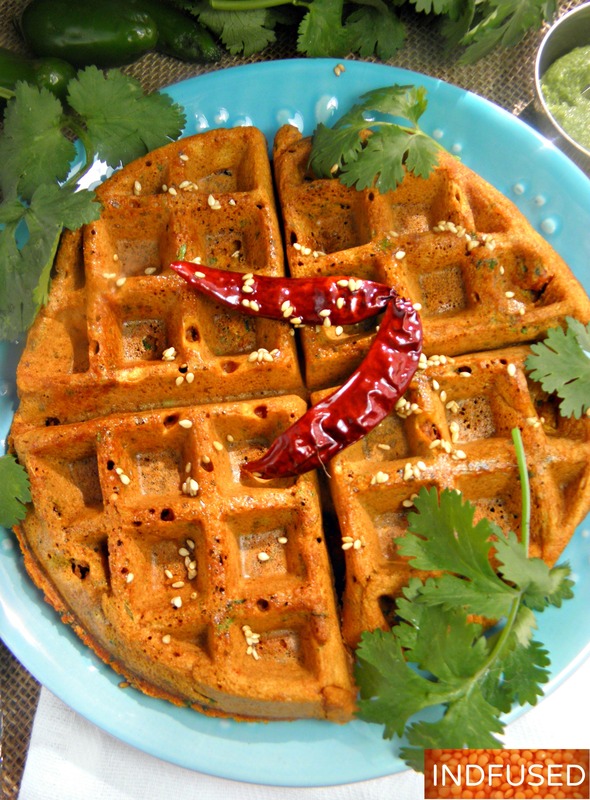 I like the idea of a savory waffle with spices for a snack or for lunch. Delicious sauce, too. Thsnks, Sandhya. You get me to try new food combinations. Thank you so much, sweet Robin! Thanks Kathryn! Do let me know how you like it! You’re quite the magician eh Sandhya? You make all these wonderful Indian recipes and delicacies minus all the fat content. I’ve never heard of these before, but it sure looks like I’d enjoy it. Yes Deepali. Plain rawa should work too. Wah re Wah! Nice Indian style waffles! You are a Queen of innovations. What a great idea to make the wadi in the waffle iron instead of frying. Thats a brilliant idea to make kothimbir vadi as waffle, just love to have a waffle rite now. This is brilliant, Sandhya! Definitely going to try it 🙂 Thanks! Let me know how you like it Freda! What a brilliant way to make kothimbir vadi look so tempting and delicious. Wonderful idea to make it in the form of waffles. I love these kinds of fusion dishes. Very innovative and nice idea. Wow! What an innovative and awesome way to have kothambir wada!! Awesome idea!